The first day of the 58 day combined tour and ten of our group decided to visit the Teotihuacan ruins which meant we could hire a private van and guide. The trip also included a visit to Basilica de Guadalupe and a visit to a shop that makes tequila and handicrafts. 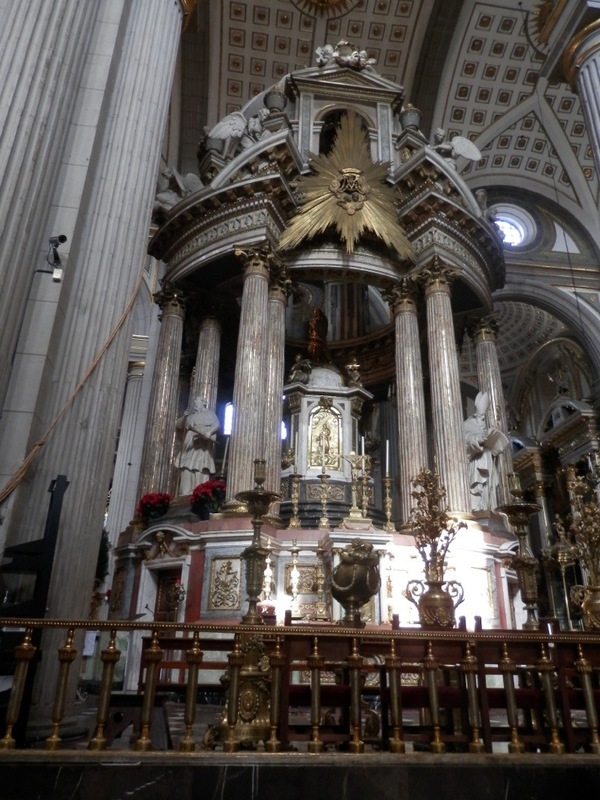 We started with a visit to the Basilica de Guadalupe which as the old Basilica (church) built during the 1500s and the more recent Basilica which has been in used since the major earthquake in 1984. The modern building allows 5,000 parishioners to attend and being a Sunday morning there seemed to be that many there when we attended. The basilica holds the apron of the Virgin Mary known locally as Our Lady of Guadalupe for appearances to a local. The old basilica has only been reopened in the last 6 months as it took over 2 decades to restore. Your can still see cracks and leaning towers. On this day there were Indians in full traditional dress and headgear who have walked 2 weeks to make an annual appearance. From here it was off to the Teotihuacan ruins which is a series of pyramids built 100 years BC. This site was used by various people’s until the 7 century. The two major pyramids are the Moon and the Sun with the Sun being the larges. They are connected by the Avenue of the Dead. The hike up these steps is not that easy especially since we are at altitude in Mexico. Later some of the girls commented that their legs will be a bit sore tomorrow. It always amazes my how the hell the built these pyramids when I visit them around the world. It is also interesting that cultures that could not of mixed built similar structures and worshiped the same gods (sun and moon) and even used similar names. Maybe we are connected more than we realise. I’m very happy I got to visit this site. During the day we also visit a shop that sells alcohol, handicrafts and other items. We got a lesson in how different plants are used as source materials. After the demonstration free shots of different alcohol products was enjoyed by all. This might have helped the vendor get some sales but not from me! On our return about half of the group decided to visit the local bullfighting which I decided against having seen it before in Spain. That left me with the late afternoon to explore Mexico City. I walked down the major plaza near our hotel down to the National Palace. The Palacio De Bellas Aryes building was impressive but the Metropolitan cathedral was even more so. In this area for Christmas they had setup all these different snow based activities. This is the only way they will see ice and snow in the capital city. Weirded seeing people skiing in such a warm climate. All the locals seemed in good spirits with Christmas approaching. Later that night we finally meet our 15th tour member Stephen who is from Iceland. We are now ready to leave Mexico City with a 2 hour public bus to Puebla.